Definition at line 307 of file PartialSymbolicSemantics2.h. Instantiates a new RiscOperators object and configures it to use semantic values and states that are defaults for PartialSymbolicSemantics. Definition at line 331 of file PartialSymbolicSemantics2.h. Definition at line 336 of file PartialSymbolicSemantics2.h. Definition at line 343 of file PartialSymbolicSemantics2.h. Definition at line 348 of file PartialSymbolicSemantics2.h. Run-time promotion of a base RiscOperators pointer to partial symbolic operators. This is a checked conversion–it will fail if from does not point to a PartialSymbolicSemantics::RiscOperators object. Definition at line 358 of file PartialSymbolicSemantics2.h. A memory map can be used to provide default values for memory cells that are read before being written. Usually one would initialize the memory map to contain all the non-writable addresses. 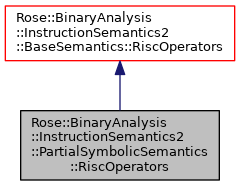 The byte-order property of the memory map is used when reading the value. Definition at line 371 of file PartialSymbolicSemantics2.h. Definition at line 372 of file PartialSymbolicSemantics2.h.